Mountain View is a city located in Santa Clara County, California, United States, named for its views of the Santa Cruz Mountains. From its origins as a stagecoach stop, it grew to a large suburb with a pedestrian-friendly downtown, free wi-fi, and a population of 74,066. 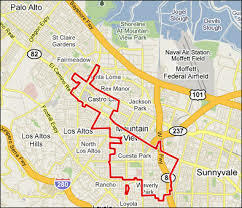 The city borders Palo Alto and the San Francisco Bay to the north and Los Altos and Moffett Federal Airfield and Sunnyvale to the south. One of the most popular places in Mt. View is the Shoreline Ampitheater, an outdoor venue for concerts galore, especially during the summer time. Concerts generally are required to stop playing around 11:30, as the Mt. View City Council has set strict guidelines. Downtown Mt. 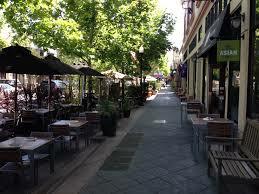 View consists of four blocks with a concentration of restaurants, cafes, and shops extend south from the downtown station. Chez TJ, one of the few restaurants rated by the Michelin Guide in the Bay Area, is located a block from Castro Street on Villa Street. Tied House, located next door, was one of the first brewpubs in the Bay Area, and is a popular stop in downtown Mt. View. Similar to other areas here in the South Bay, Mt. View is currently undergoing (summer 2016) a market correction, with longer DOM (days on the market), sellers reducing prices on over-priced homes, and because of a low inventory, we still are seeing multiple-offers, but perhaps only 5 or less instead of over 10 per listing. Home values in Mt. View range in the high $800s up to $2M plus.